As drones have become more common and affordable, many animal-loving people have worried about their tendency to scare wildlife. Yet that problem may have a silver lining: drones might be used to scare animals away from crops, resolving conflicts with fright rather than lethal force. 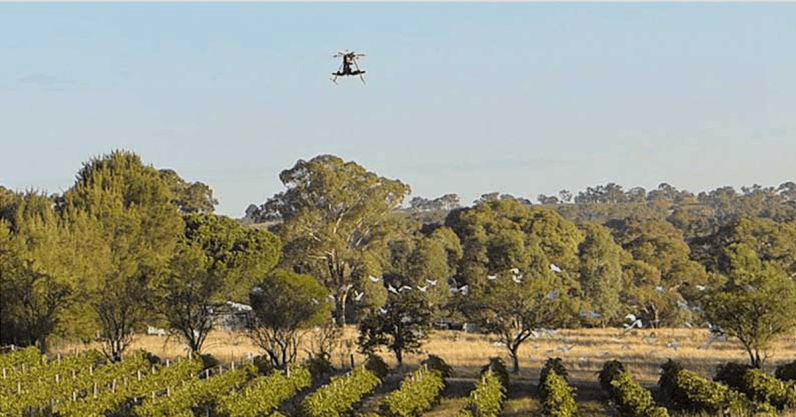 In a study published in the journal Crop Protection, researchers led by Zihao Wang, an aerospace engineer at the University of Sydney, describe their deployment of an unmanned aerial vehicle (UAV) at Australian vineyards confronted by ravens and cockatoos with a taste for grapes. This is no small matter: some vineyards have reported crop losses of up to 83 percent, and current methods of crop protection leave much to be desired. Bird-excluding nets are cumbersome. Chemical repellents have unintended environmental consequences. Loud noises and scarecrows can work for a little while, but target animals soon become habituated to them. Poisoning or shooting crop-eating animals likewise provides temporary relief — but there are always more hungry critters to take their place, and death is hardly a fair punishment for eating someone else’s food. One method that’s proved effective is the use of trained falcons to scare birds away, but it’s also quite expensive. Enter Zhang and colleagues’ drones. Drawing upon research into the responses of birds to unfamiliar predators, the researchers outfitted an off-the-shelf hexacopter — a six-rotor UAV commonly used by hobbyists to take aerial photos — with the taxidermied body of a dead crow, plus a loudspeaker that broadcast the distress calls of several bird species. The researchers figured that any bird confronted by that airborne grotesquerie would think the crow had been seized by some unknown beast. Indeed they did. Flocks chased by the UAV, which was operated at a distance by the researchers, quickly fled from the vineyards. They either left the area altogether or settled hundreds of meters away, and stayed away the rest of the day. More research on other species and over longer time frames is necessary — the trial runs involved only cockatoos, ravens, starlings, and silvereyes, and they might eventually learn that the drone is actually harmless — but the results are promising. If they hold up, and if the drones can be programmed to run autonomously rather than requiring human operators, farmers could have a crop-protection tool that’s affordable, effective, and humane. Source: Wang et al. “Psychological warfare in vineyard: Using drones and bird psychology to control bird damage to wine grapes.” Crop Protection, 2019. This piece was originally published by Brandon Keim on Anthropocene Magazine, a publication of Future Earth dedicated to creating a Human Age we actually want to live in.